Exploring the Chinese market and Sharing global business opportunities. The world’s most influential platform for investment promotion. A global investment event approved by UFI (the global association of the exhibition industry). The 2017 China International Fair for Investment & Trade is scheduled to take place during September 18th-21st, 2017 in Xiamen, China. In view of the growing trend of international investment cooperation themed by ‘Introducing FDI’ and ‘Going Global’, integrating exhibition, forums and seminars, B2B project matchmaking, high-end protocol meeting, investment salon and etc., the 2017 CIFIT-Xiamen focuses on tangible business effect as well as investment policy and environmental promotion. Each year, the CIFIT receives over 100,000 professional participants’ attendances, including 15,000 overseas visitors from government institutions, investment promotion agencies, business associations and multinational corporations in more than 100 countries and regions, as well as 50,000 business professionals and government officials from more than 300 major cities in China. Over 1,500 correspondents from hundreds of domestic and foreign media organizations will extensively cover the fair. Since Xiamen is going to host the 9th BRICS Summit in September, 2017, the 2017 CIFIT-Xiamen will take full use of the BRICS Summit’s influence in post-conference period. With the innovation idea of ‘Extensive Matchmaking’, centered on the practical needs of exhibitors and visitors, the 2017 CIFIT-Xiamen integrates project negotiation into every major event to drive tangible business effect. Exploring hot topics on ‘One Belt And One Road’, Free Trade Zone, Internet plus, M & A services, etc., the 2017 CIFIT-Xiamen will organize a series of events including Guest Country of Honor, Guest Province of Honor, Star City, Star Country, etc. With professional investment promotion exhibitions, high-level forums and project matchmaking activities arranged, the CIFIT is a one-stop service platform for global participants to share investment information, tap business opportunities and promote bilateral or multilateral economic cooperation and exchange. The CIFIT Organizing Committee sincerely welcomes investment promotion agencies, chambers of commerce, industrial associations, multinational corporations and renowned companies worldwide to its great platform to create and share business opportunities. Complete forms can be obtained at the Flanders-China Chamber of Commerce. 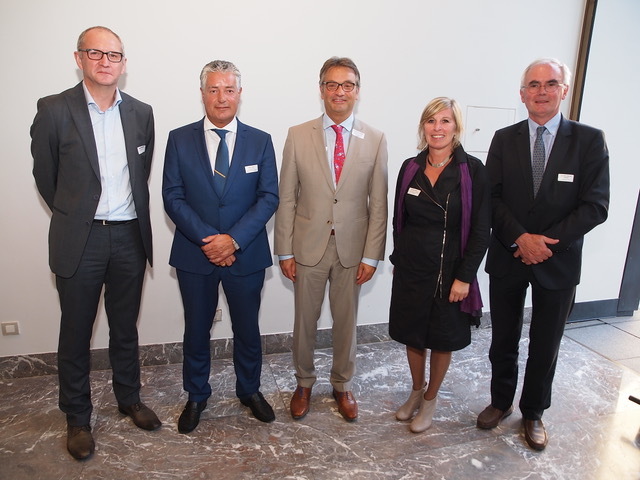 From left to right: Johan Verstraete; Board Member FCCC and Vice-President Marketing, Sales & Services Weaving Solutions Picanol; Marc Vinck, future Ambassador of Belgium in the People’s Republic of China; Stefaan Vanhooren, Chairman FCCC and President Agfa Graphics, Member of the Executive Committee of the Agfa Gevaert Group; Gwenn Sonck, Executive Director FCCC; and Philippe Van der Donckt, Vice-Chairman FCCc and Business Development Director Umicore. The Flanders-China Chamber of Commerce (FCCC) organized a meeting with the future Ambassador of Belgium in China. This event took place on 19 June 2017 at ING Art Center in Brussels. Mr Stefaan Vanhooren, Chairman, Flanders-China Chamber of Commerce and Mr Marc Vinck, future Ambassador of Belgium in the People’s Republic of China, delivered speeches at the event, which was concluded by an exchange of views and networking. Ford Motor Co will export vehicles from China to the United States for the first time starting in 2019. Ford said that it plans to move production of its Ford Focus small car from the U.S. to China, where it already makes the Focus for Chinese buyers. Sales of small cars have dropped sharply in the U.S., and companies are seeking to cut costs. Joe Hinrichs, Ford’s President of Global Operations, said the move to China will save the company USD1 billion, including USD500 million for canceling plans to build the Focus in Mexico. Ford said the move won’t cost U.S. jobs. The suburban Detroit plant that currently makes the Focus will be converted late next year to produce the Ford Ranger pickup and Ford Bronco SUV. Hinrichs said Ford’s research shows that customers care more about product quality than where their vehicles are made. Hinrichs said Chinese wages are lower than wages in Mexico, although the cost to ship the vehicles erases some of that advantage. It is still cheaper to make cars for the U.S. in Mexico, he said, but Ford has extra capacity in China and the move frees up capital for the company immediately, the Shanghai Daily reports. China’s booming fintech sector is drawing closer scrutiny from regulators who are confronted with the dilemma of how to establish better monitoring without the regulatory overreach that would stifle innovation in the sector. The People’s Bank of China (PBOC) has recently set up a fintech committee and stressed that it will adopt artificial intelligence (AI) to better monitor fintech players. “Fintech is growing really fast in China, which has become a global leader in the field. In such a big financial market, the industry has a powerful internal dynamic,” said Sun Guofeng, Director of PBOC’s Research Institute, at a public forum in Qingdao. “It poses a great challenge for regulators to control risks deriving from the disruptive emergence of the industry.” Fintech firms typically use technology, such as mobile phones and cloud computing, to provide more affordable and easier-to-access financial services to a wider population, from online loans and insurance to e-payment and crowd-funding investment. In 2016, investment in China’s fintech firms more than tripled to a record USD10 billion, surpassing the U.S. for the first time and accounting for 43% of global fintech investment, according to Accenture. Leading the deals was Alibaba’s financial-services affiliate Ant Financial, which closed a USD4.5 billion fundraising round in April 2016. The company operates the popular online payment platform Alipay. The number of mobile payment users increased to a record 459 million in 2016, up 31% from the previous year. The total transaction value of mobile payment also rose 46% to CNY157.6 trillion. Non-bank payment agencies’ online transactions reached CNY26.5 trillion in value in the first quarter, making up 3.55% of the total amount of online transactions, up 1 percentage point from the same period last year. Alipay and WeChat have become leading players in the mobile payment area, the South China Morning Post reports. Shanghai will accelerate opening up in financial services to build an international financial center by 2020 and serve the Belt and Road Initiative, authorities told the Lujiazui Forum. Zhou Xiaochuan, Governor of the People’s Bank of China (PBOC), said the Cross-border Interbank Payment System will soon be launched in Shanghai to help internationalization of the yuan. The system provides clearing and payment services for financial institutions in the cross-border and offshore yuan business, and the first phase started in 2015 to mainly deal with trade, direct investment and financing businesses. The second phase is expected to adopt a more comprehensive clearing method to lift operational efficiency. Governor Zhou said further opening up is necessary to clean up irregularities and enhance the competitiveness of local institutions. Shanghai Mayor Ying Yong said the city will actively drive internationalization of the yuan, implement financial reforms in the free trade zone (FTZ), accelerate building an internationally oriented financial system, build a global yuan services system, and steadily drive trials for yuan convertibility under the capital account. “The next few years is the sprint stage in Shanghai’s construction of an international financial center,” Shanghai Mayor Ying Yong said. Added-value from the financial services industry contributed 17% to Shanghai’s GDP last year, making it a pillar industry for the city’s economy.